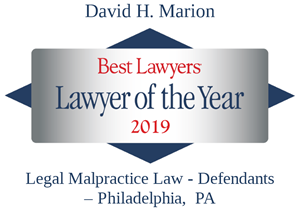 White and Williams is pleased to announce that David H. Marion, Senior Counsel, has received the Best Lawyers 2019 Legal Malpractice Law - Defendants "Lawyer of the Year" award in Philadelphia. Recently named one of The Philadelphia Inquirer’s 2018 Influencers of Law in the area of Litigation and Dispute, David was again recognized by his peers for his notable litigation career and extraordinary record of success. Lawyers on The Best Lawyers in America list are reviewed by their peers on the basis of professional expertise and undergo an authentication process to make sure they are in current practice and in good standing. "Lawyer of the Year" recognitions are awarded to individual lawyers with the highest overall peer-feedback for a specific practice area and geographic location. In addition to receiving the "Lawyer of the Year" distinction, David was uniquely recognized on the 2019 Best Lawyers in America list in six areas of practice. His extensive experience and superior results earned him a place on the Appellate Practice, Bet-the-Company Litigation, Commercial Litigation, First Amendment Law, Legal Malpractice Law - Defendants, and Media Law Best Lawyer lists. David has achieved numerous noteworthy victories throughout his career including substantial jury verdicts before federal and state courts, the defense of a major public utility in a precedent-setting federal ERISA class action, and victories in the U.S. Supreme Court and state and federal appellate courts throughout the country. He was appointed by the U.S. District Court as Receiver in a Securities and Exchange Commission civil action involving a Ponzi scheme, and as Special Master in a number of complex federal cases. 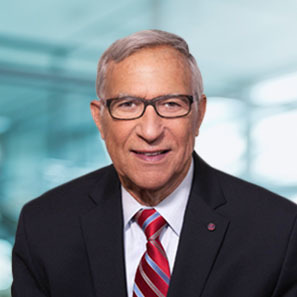 David was elected by his peers as a Fellow of the American Academy of Appellate Lawyers, the American College of Trial Lawyers, and the International Academy of Trial Lawyers.